CEC publications include research reports, studies, developmental stories, proceedings of international symposiums/ workshops/ seminars, annual reports and CSR reports, brochures, and pamphlets. Such rich compendiums and information dockets comprise CEC's in-house documents and also as publications on behalf of its clients and partners such as IUCN, Plan India, and UNESCO, among many others. CEC publications span the entire gamut of the development sector and also the corporate sector, showcasing their engagement with environment and its related issues. Via its publications CEC brings to a discerning audience a wealth of qualitative, in-depth, diverse, and engaging reading material showcasing. exemplary work being done in the field of environment across India to highlight the strength of India's environment initiatives on a global platform and provoke greater curiosity towards and engagement with environment and its conservation among the citizens. 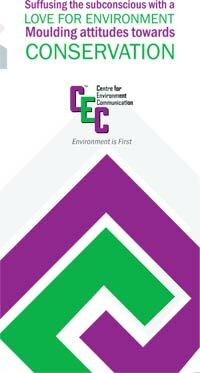 An active layout and an energetic combination of the colours green and purple are the hallmarks of the brochure designed by EG for the Centre for Environment Communication (CEC). CEC is committed to raising awareness among children, youth, and adults proactively on environmental issues and promoting action to concretise the awareness. The design effectively captures this progressive and inclusive mission of CEC by highlighting via text, colours and evocative icons, the areas of CEC engagement, its mission, the thematic centres, its flagship initiatives and its areas of expertise.